I have a completed garment for the Burda Sew Along. Fabric: Ponte knit from Spotlight. This is a pretty easy pattern, and I've made it once before so I didn't have to trace the pattern off. I wanted it to be a bit longer so I could wear it as a dress, so I added about 20 cm but then I put a huge hem on it, so I probably could have added only about 10 cm. Now to think about what to make next. It's not easy taking photos of yourself wearing socks. Wonders will never cease, I have joined my first Sew Along. 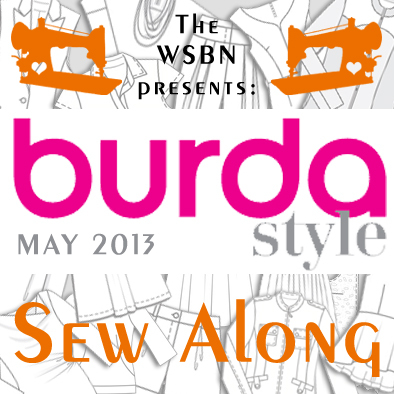 It's being hosted by the Wellington Sewing Blogger Network and all you have to do is sew at least one item, or more, from a Burda magazine in your posession. I think I can manage to do that, it's not like I don't have enough magazines to choose from. To kick it off, the curious kiwi has invited us to show our burda collection but I'm pretty sure you don't want to see photos of my entire collection so I'm just going to show a few highlights. Here's my oldest burda, from my Mum who got me started on sewing with burda. And here are my newest additions, January and February 2013. I buy from the local shop rather than a subscription, so these are the latest copies available in my part of the world. And how did I get hooked on burda, well I started off with Carina, a burda young fashions magazine when I was a teenager. I didn't get it for long, I think I discovered it at the tail-end of it's life. It morphed into Miss B and then Bonnie. Once they disappeared from the local bookshop's shelves I used to get neue mode and then sometime around the 90s that disappeared too and I made the move to the burda magazine which I have successfully accumulated copies of ever since. I have hauled the stack(s) of magazines around with me for years, and yes, I have made a few things from them. I have also spend many hours just looking through them, planning what I could sew. So on to my favourites, it's a tough choice but I'm going to go with my first two Carinas; issue 10 October 1983 & issue 12 December 1983. Laugh away at the fashions, I thought they were pretty cool (still do but I keep that quiet).